What is the Water Cube? 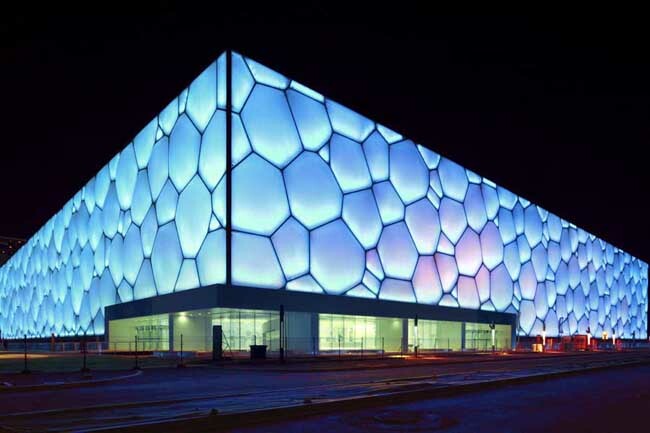 Located in the Olympic Park, Water Cube could accommodate 17,000 seats during the period of the 2008 Beijing Olympic Games. Nowadays, it becomes an international advanced center offering facilities for swimming, other water sports and leisure, and themed bar and restaurant. Water Cube offers a variety of facilities to explore. Covering an area of about 20,000 square meters, Water Park at Water Cube is an indoor leisure park with advanced facilities and good comfort. The park has ten water recreation activities with a total of more than 20 slides for visitors to experience. This facilities will offer you unexpected thrill and excitement. Located in the west part of Water Cube, the Warm-up Pool also known as Huo Yingdong Pool was built based on the international competition standards. It is divided into deep water area and shallow water area. The water in the pool is completely disinfected by ozone disinfection and Chlorination, which ensures the quality of the pool water to the utmost extent. The pool is open to the public. Therefore, you can practise your swimming skills in the pool. If interested, you also can admire the Memorial Exhibition for Beijing Olympic Games Water Cube Swimming to know some on the wonderful moment of Chinese swimming cause and the epic beauty of the 2008 Beijing Olympics Games. At Water Cube, you could get acquainted with the construction process of the Water Cube through rich physical exhibits and high-tech displays, and experience the three concepts of “green, technology and humanity” . At Water-drop Theater, you can enjoy publicity videos of the Olympic Games and charged 3D films. The theater always accommodates 150 seats with an area of 200 square meters. In addition, the Water Cube is equipped with leisure bar, cafe, bubble bar, and small function rooms to meet your business or personal needs. If you are planning to visit Water Cube for photography purposes, the best time to visit is in the evening during the opening hours. The best months to visit it are from May to July and from September to November. There are several buses passing by the Water Cube. Therefore, there are several options. Rent a vehicle to the Water Cube. This is the quickest and most direct option. Take Bus 81, 82, 510 and Bus 607 to the Stop of Beichen Xiqiao Bei (北辰西桥北站). Then, walk to the Water Cube. Take Metro Line 8 to the Stop of Olympic Park (奥林匹克公园站). Then, walk southward for 1 kilometer. Opening hours: 09:00 - 21:00. The Water Cube reserves the right to change the opening hours. Opening hours for Water Park: 10:00 - 18:00 ( April 30 - June 15 and September 1 - September 30); 10:00 - 22:00 (June 16 - August 31). From the 8th of October, it is closed. Opening hours for Water-drop Theater: Tuesday - Sunday. The children under 6 years old are not allowed to visit the theater and those who suffer from heart diseases and high blood pressure are not allowed to visit the theater either. As at 17th October 2018, the entrance pricing to Water Cube is 30 CNY per person; the elder above 60 years old (60 years old included) and the children between 1.2m tall (1.2m tall included) and 1.4m tall (1.4m tall not included) are charged 15 CNY per person. As at 17th October 2018, the entrance pricing to Warm-up Pool is 60 CNY per person. Children under 1.5m tall shall be accompanied by parents into Warm-up Pool. You can swim in the Warm-up Pool up to 120 minutes. If you stay there longer, you should pay for the longer time in CNY cash. As at 17th October 2018, the entrance pricing for the daytime to Water Park is 200 CNY per person from April 30 to June 15 and from September 1 to September 30; the entrance pricing for the daytime to Water Park is 260 CNY per person from June 16 to August 31 and from October 1 to October 7; the entrance pricing for the evening to Water Park is 200 CNY per person ( person above 1.2m tall (1.2m tall not included)) around the year. From April 30 to June 15 and from September 1 to September 30, children between 1.2m tall (1.2m tall not included) and 1.5m tall (1.5m tall not included) are charged 180 CNY per person; from June 16 to August 31 and from October 1 to October 7, children between 1.2m tall (1.2m tall not included) and 1.5m tall (1.5m tall not included) are charged 220 CNY per person. Children under 1.2m tall (1.2m tall included) are free of charge. As at 17th October 2018, the entrance pricing to 3D film at Water-drop Theater is 20 CNY per person. The Water Cube offers time-limited English interpretation service. The pricing for the service is 150 one time. It is not allowed to smoke at Water Cube. There is security check at Water Cube. Therefore, it is suggested to take light luggage with you. It is recommended that you take swimsuit, towels, more clothes to get changed if you are interested to enjoy yourself at Warm-up Pool and Water Park. Interested in visiting the Water Cube on a Tour? Wendy Wei Tours offers a variety of different packaged tours as well as custom tours including the Water Cube, among other attractions and destinations. To find out more, please visit our Tours page or Contact Us directly to find out more.